Each year Cast members use thousands of Christmas trees, miles of garland and lights to transform Walt Disney World into a jolly, holiday scene. There is a team of 35+ cast members who install everything, working mostly at night. - Witness the stirring Candlelight Processional, a retelling of the Christmas story brought to life by a 50-piece live orchestra, choir and celebrity narrator. - Turn “ho-ho-ho’s" into "ha-ha-ha’s" as you experience the “Jingle Cruise”—a.k.a. the world-famous Jungle Cruise, infused with festive sights and plenty of holiday pun-chlines! - Meet the talented Event & Decorating Support team responsible for turning the entire Resort into a winter wonderland and producing thousands of grand-scale events each year. - Enjoy an early, family-style barbecue dinner included with your tour. In addition, each Guest will also receive a limited-edition keepsake pin exclusive to this tour! 3 hours, must be 16+ (valid photo ID required), Park admission not required. Call 407-WDW-TOUR to book. - Come upon the Cast Members of Holiday Services—the “elves” who create the decorations used to dress up Walt Disney World Resort theme parks and hotels. - Explore World Showcase and hear how holidays are celebrated around the globe: Christmasfest in Germany, the legend of La Befana in Italy and the diversity of traditions at The American Adventure. - Get an up-close look at the traditional trimmings of Main Street, U.S.A. and see a Currier & Ives-themed Christmas bring the spirit of Santa Claus to life. - Visit a Resort hotel and learn how the lavish holiday atmosphere is created through the grand-scale application of color, texture, architecture, illusion and attention to detail. In addition, each Guest will also receive a special treat and a holiday keepsake! Throughout the holidays, World Showcase comes alive with the legends and lore of the season. Guests will find holiday storytellers, such as Père Noel in France, La Befana in Italy, and Santa Claus at the American Adventure, as well as Kwanzaa and Hanukkah exhibits in The American Adventure Rotunda. An Epcot Tree Lighting Treat - (World Showcase Plaza Tree Stage - approximate show length is 10 minutes). Join Mickey and his friends as they share their holiday traditions! Performed daily at 6:00 p.m.
IllumiNations: Reflections of Earth - featuring a special Holiday-themed finale. The World Showcase Promenade comes alive nightly with the brilliance and splendor of music, lights, lasers, water fountains, and custom pyrotechnics in our signature nighttime spectacular ,llumiNations: Reflections of Earth. Every night we are proud to present a unique holiday finale. With the song "Let There Be Peace On Earth" at its center, this special musical tag features the voice of Walter Cronkite who offers a special message of peace and good will. 5:00 p.m., 6:45 p.m., and 8:15 p.m. The processional includes the telling and singing of the Christmas story told by a live massed choir consisting of choir groups from around the country, the Walt Disney World Resort Cast Choir and celebrity narrators, with the music from a 50-piece orchestra. Guests can purchase a special package that includes dinner at an Epcot restaurant plus preferred seating for the Candlelight Processional. For more information contact 407/WDW-DINE. More details here. "Belle's Enchanted Christmas" at Fairy Tale Garden. "Celebrate the Season" at Cinderella Castle forecourt stage. "Twas the Night Before Christmas" at the Galaxy Palace Theater. "Country Bear Christmas Special" at Grizzly Hall in Frontierland. 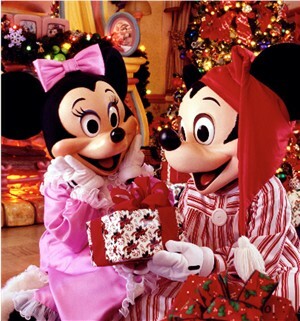 Mickey Mouse and friends will celebrate the season with Mickey's Very Merry Christmas Party. Guests can enjoy the classic theme park parade, which features holiday floats, characters, dancers, snowmen, Santa Claus and more. A magical night of holiday snow, carolers, character greeting, live stage shows, holiday fireworks, souvenir family photos, refreshments, plus the most popular Magic Kingdom attractions remain open. This is a separate ticketed event. More information here. The Disney Springs area will enhance the guest shopping and dining experiences during the holiday season with wintry decor, seasonal songs and appearances by Santa Claus. The Disney Resorts will also glimmer with displays of holiday decor, featuring gingerbread houses, carousels, carolers and huge Christmas trees. Don't forget to ask about special visitors on Christmas Eve! Boma-Flavors of Africa will have a miniature African village (entirely edible) made out of yummy chocolate, gingerbread and sugar. The houses and buildings will be inspired by architecture styles throughout Africa. A life-size, completely edible carousel -- made with gingerbread, chocolate and sugar paste -- will be located in the lobby. Small gingerbread houses and Christmas stollen will be sold in the merchandise stores. Chefs will give demonstrations throughout the day giving tips to guests on how to decorate their own gingerbread creations. A 15-by-20-foot display depicting a boardwalk area with a five-foot-tall Ferris wheel, carousel, water slide, buildings and a beach area. Everything will be made with chocolate, sugar and gingerbread. Better than a day at the beach. A gingerbread holiday village will be on display in the main building of the hotel, on the 4th floor. Inside a life-size holiday gingerbread house, guests may purchase mouth-watering Santa lollipops, gingerbread cookie people, gingerbread ornaments, gingerbread cookies, stollen bread, and Grand Floridian chocolate logo boxes filled with truffles, peppermint bark and small gingerbread houses. Gingerbread house fun facts: 400 hours are spent on baking the gingerbread and 160 hours are spent on decorating the house. On the 2nd floor of the Ceremonial House pastry chefs will create an exotic gingerbread village with volcanoes and edible palm trees. Christmas cookies, biscotti and other confectionary delights will be sold at the Kona Island coffee bar. In the resort's lobby a miniature train races around a sugary mountain and village. Small gingerbread houses, Christmas stollen and pannettone (traditional Italian bread) are sold in the merchandise stores.